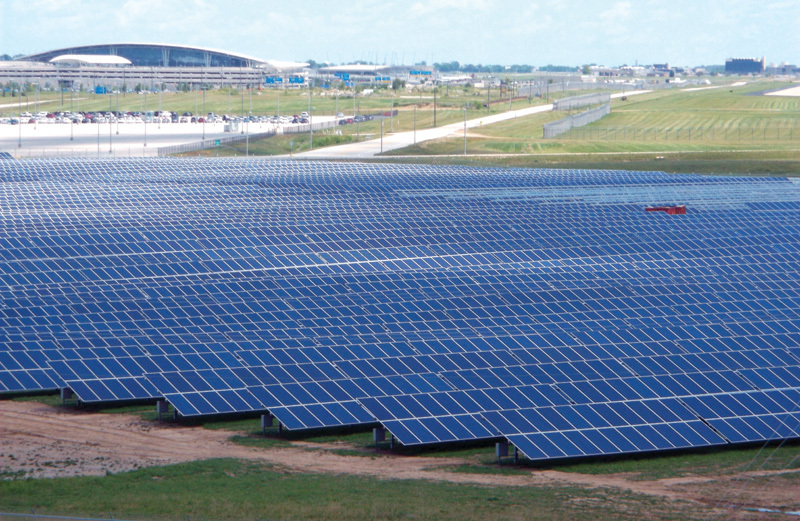 With the installation of a 12.5-MW solar project on 70 acres of airport land, the Indianapolis International Airport now has the largest airport solar facility in North America. Travelers flying into theIndianapolis International Airport might not know what they're seeing at first-something that looks black and covers almost 70 acres. What's below them is the largest solar power facility in Indiana and the largest airport solar power facility in North America. Telamon Corporation and JohnsonMelloh Solutions (JMS) partnered with the Indianapolis Airport Authority (IAA), the City of Indianapolis, Indianapolis Power & Light Company (IPL), General Energy Solutions (GES), and Cenergy Power to build this large solar farm. The facility is composed of 44,128 solar panels and creates enough renewable energy to prevent approximately 10,700 tons of carbon dioxide from being released into the environment each year-or the equivalent of removing approximately 2,000 cars from the roadways. The project got rolling in earnest in late 2012 when local project developer Telamon Corporation began talks with General Energy Solutions. "We (GES) worked closely with Telamon and Johnson Melloh Solutions for a few months and officially came on board in December 2012 as the project owners," says Joe Wang, project manager for GES. "From there, we took all the steps to bring the project to completion-co-working with the EPC [engineering, procurement, and construction] company, Cenergy Power, to complete the work. By the time we came on board, the project was set in place. The site host was the Indianapolis Airport Authority, and the offtaker was going to be Indianapolis Power & Light Company." Due to the airport location and size of the project (in addition to environmental concerns), permitting took a bit longer than normal but nothing out of the ordinary, says Wang. The players worked well together, and construction was soon underway. "The bigger challenge," says Wang, "was getting through all of the negotiations and agreements with the partners. That took many discussions and coordination. After that, it was pretty much just design and construction." Groundbreaking took place in March 2013. It was a big event and representatives from business, the government, and renewable energy were on hand. 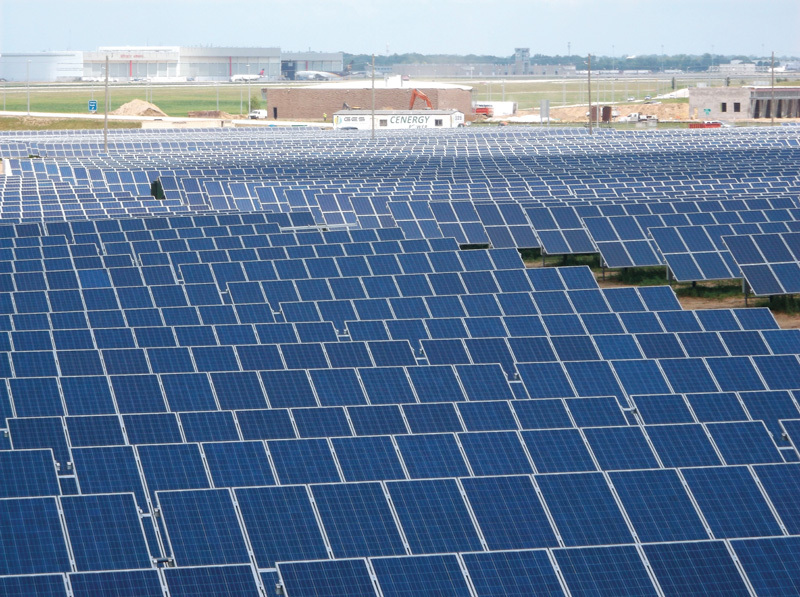 "Hosting the largest airport-based solar farm in the country supports both environmental and economic sustainability at the Indianapolis International Airport," said Robert Duncan, executive director of the Indianapolis Airport Authority, at the event. Travelers flying into the Indianapolis International Airport have a bird's-eye view of the solar project, which covers almost 70 acres-the largest solar power facility in Indiana. "Through this public-private partnership, we are able to create a use for otherwise undevelopable land, benefit from a new source of non-airline revenue, increase the tax revenues we generate for local municipalities, and add to the many ways we incorporate sustainability into airport operations." The construction got underway immediately after the groundbreaking. The large project was hard to miss, not only due to its size, but also because it was right off highway I-70. This meant relatively easy access for the construction workers. The EPC, Cenergy Power, hired primarily local subcontractors for the project. Wang says using local talent is usually the preferred and efficient way to go. Not only are the subcontractors close by, they also understand the issues. In this case, Banta Electrical Contractors Inc. and ERMCO Inc. were hired to do the electrical work, and local subcontractors were also used for road excavation, construction, and fencing. The only challenge the construction team ran into was weather. For safety reasons they couldn't work during either snowy or rainy days. Despite the weather delays, construction was finished faster than anticipated. "We technically started mobilizing in late March, and we finished up in early October," says Wang. "So it was about six-and-a-half months for the construction period." The team was able to catch up from weather delays during the paneling phase. The subcontractors were able to install paneling at an unprecedented rate, says Wang. At their peak, they were installing over 2,000 panels a day. "We decided to go with our own GES panels because we believe that our panels are high quality with a high efficiency rate and offer warrantied durability," says Wang. "The Sharp panels were part of our safe harbor under the 1603 Treasury Program and were already purchased in 2011." Glare from the panels was initially a concern. No one wants pilots blinded as they come in to land a plane. Wang says that an extensive reflectivity study was done ahead of time. During construction, before the panels were installed, portions of the racking were covered to ensure there was no glare. So far, there have been no problems, but if any arise the airport will definitely let GES know. The $35 million project came in on time and on budget. 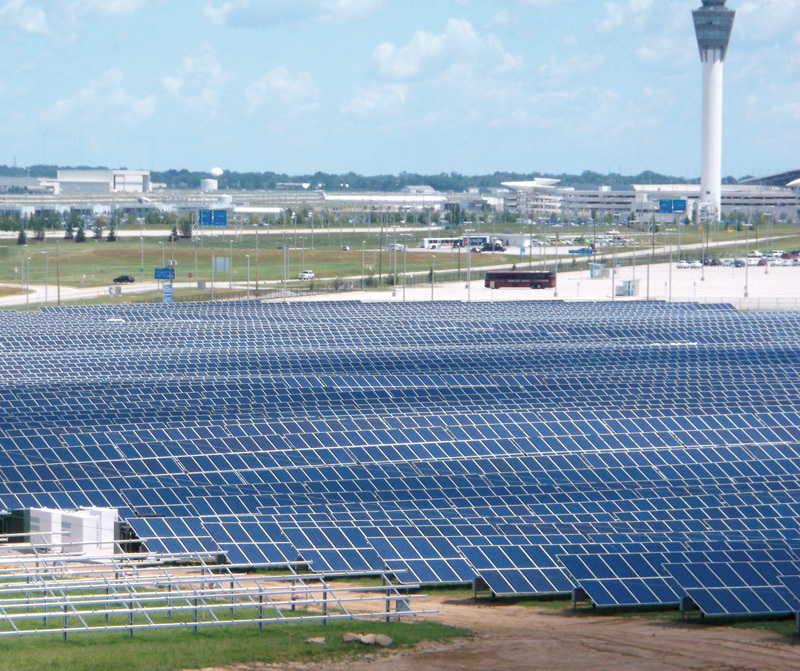 The solar energy produced is currently sold to Indianapolis Power & Light through a 15-year power purchase program and fed into the grid of existing surface transmission lines that connect the airport terminal to the IPL substation west of the airport. As is common for an airport facility, the airport is the landlord for the system, and GES rents the land. The solar plant doesn't require anyone on site. All the monitoring is done wirelessly. However, when it snows-which happens often during Indiana winters-a live body will need to be available to go out and clear the panels. GES might not be as well known as some solar energy companies, but don't expect that to be the case for long. The up-and-coming company's parent company is a manufacturer in Taiwan, and it is focused on developing other projects all over the world. "We have an active pipeline and are continually welcoming inquiries," says Wang. One of its current projects is Phase II of the Indianapolis International Airport project. It will be much like the current project, on nearby land. It will also be about the same size-12.5 megawatts. "If they will allow us to go bigger, we will," says Wang. "That would be ideal." Now that Phase I is complete, GES can look back on it with pride. Wang is especially proud of the speed in which they were able to put up a facility of this size. "It's an extraordinary feat to accomplish." He says they were able to pull it off because of the excellent planning that went into the project ahead of time. "Another factor was finding the right help," Wang says. "Our contractor and our subcontractors were really great-they were awesome. This is the first time we've worked with Cenergy, and we will probably continue to work with them on future projects." Wang adds, "It also helps that we didn't run into any big issues-and we had good luck. Everything just worked well on this project." Like all projects, good partners tend to make for a successful project. "It was a really good team," says Wang, who spent a lot of days on site working with all the players. That bodes well for Phase II, which looks to include the same partners again. Wang says what he liked about working with this team was their professionalism. "Everyone was easy to work with and accommodating and flexible, and that's important with these types of projects. When things arise, you've got to be able to switch your hat and be flexible and continue with new issues that arise"
At the end of the day, the Indiana airport facility is a win/win for everyone. The project is seen as a great investment in renewable energy, allowing Indiana, a state better known for coal-generated power, to add to its sustainable portfolio. It also allows the airport to make use of what was wasted space that had been used for growing hay. What was once vacant land is now providing continuous renewable energy for customers of utility Indianapolis Power & Light Company. "Solar generation is an important part of IPL's commitment to developing alternative resources," said Ken Zagzebski, IPL's president and CEO. "We have increased our diverse resources portfolio ranking eighth in the U.S. in available wind-capacity on a per customer basis, and we look forward to this possible significant increase in solar generation."